1942 Dad worked. 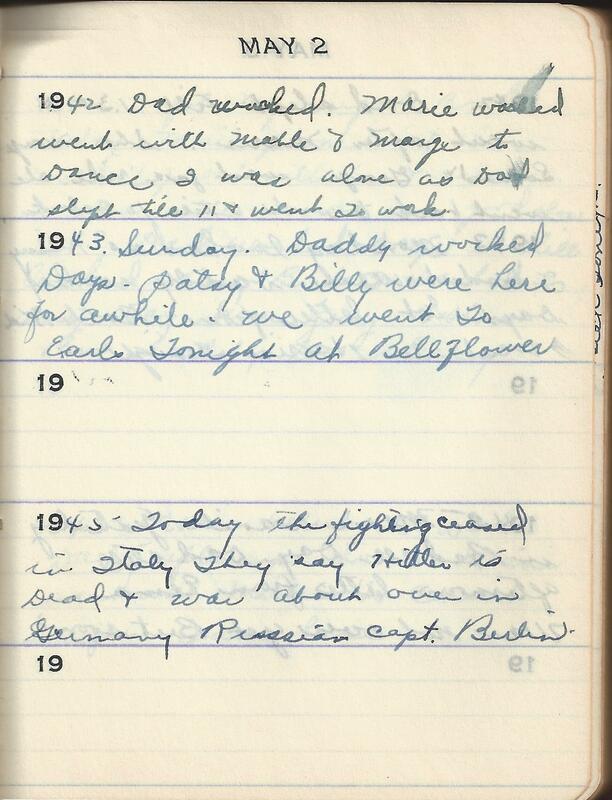 Marie worked went with Mable & Marge to Dance I was alone as Dad slept till 11 & went To work. 1945 Today the fighting ceased in Italy They say Hitler is Dead & war about over in Germany. Russian capt. Berlin. 1943 entry: Belleflower is now a suburb of Los Angeles CA. 1945 entry: They must have been so excited to think the war was almost over. This entry was posted in Tennant, Uncategorized, Wright and tagged Bellflower CA, Family history, genealogy, Hitler, Italy, Martha Marie Tennant, Martha Marie Wright, Martha Marie Wright Tennant, Martha Tennant, Rene Baron, Sylvia Rene Stevens. Bookmark the permalink.